More highly dangerous flooding likely for California. Before getting into the serious topic of the floods that will occur as a result of latest storm to affect California, it need to point out another catastrophically wrong forecast from climate 'science.' The 100-year drought ended 97 years early. That terrible forecast enabled politicians and other decision makers to defer maintenance on dams and other projects to bring water to a thirsty state. 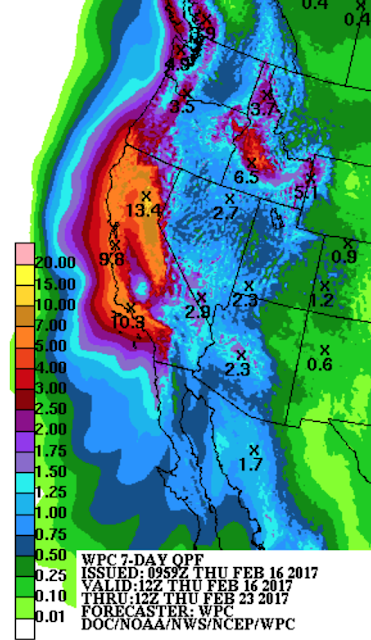 Now, to the issue of more torrential rain coming to California. Yes, the NWS is forecasting 13.4" of rain over the next seven days in the Oroville River/Dam's watershed. It is also forecasting as much as 10.9 inches of rain near Santa Barbara with heavy rains extending east into the mountains above the Los Angeles basin. 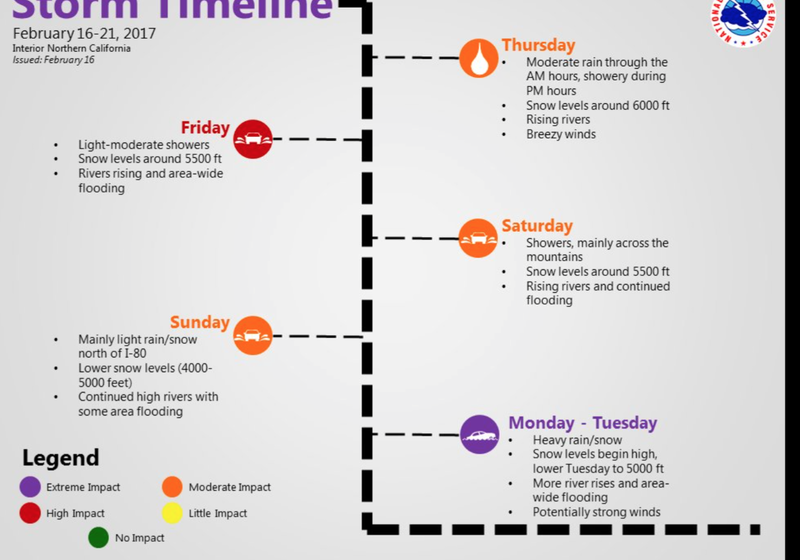 Given the wet soil and already high levels of water in reservoirs and rivers, flooding will likely occur in areas that rarely flood. If you live in one of those areas, I urge you to plan now! Pack valuables in a "go kit" -- so you can rapidly put them in your car if called to evacuate quickly. Make sure you have plenty of cash. Your car should be filled with fuel. Cell phone and laptop should be kept fully charged. Good luck. I'll keep updating on this situation. ADDITION: 11:21pm PST from the NWS in Sacramento.